PACT Dispenser/Scale Combo, and the RCBS Chargemaster Combo. All three machines have decent controls and throw charges within ± 0.1 grain. That’s as good as most people can probably do with a reasonably-priced balance-beam scale. The user-friendly RCBS unit is the fastest dispenser, and it was our clear favorite. The PACT unit ranked second in dispensing speed, and it proved to be the best machine in terms of cleaning and powder removal. However, unlike the Lyman and RCBS, the PACT needs to be re-calibrated every time you change powders. The Lyman 1200 has good memory features, but the warm-up time is very slow, and removing powder is more difficult than with the other machines. Bottom Line: Get the RCBS. No doubt about it — it’s the best available. But any one of the units can reduce your loading time signficantly. The RCBS is the fastest unit, dispensing a 50.5gr load of extruded H4831sc powder in 8.95 seconds on average. This was twice as fast as the Lyman and about 64% faster than the PACT. (NOTE: we tested the latest PACT version with Speed Upgrade). The Lyman and the PACT were neck and neck in the IMR 4064 tests, but the RCBS Chargemaster still beat them both by 10 seconds per charge dropped. Overall we conclude the RCBS is roughly twice as fast as the other dispensers, at least for extruded powders, which all machines handled with ease. (The ability to handle long, extruded powders is important because these popular propellants often give manual powder measures fits, requiring you to stop and re-throw when the long kernels jam. Being able to dispense long powder kernels with ease is a significant “real world” advantage for the digital dispensers.) The times below were calculated with a stop-watch then averaged. We did 20 throws per machine for each powder. While not perfect the ChargeMaster provides an enviable record. To put the results in context, I’ve noted up to 0.4 grains weight variance in a single box of Federal Gold Medal Match. This is not to degrade FGMM but rather to serve as a reality check on expected performance. I was very surprised to see how far off the PACT scale seems to be. It was zeroed twice, however, the pan had to be zeroed out three or four times during the 20 charge run. Can’t believe I actually used the blessed thing to gauge the accuracy of my Harrell’s Culver Measure. With a street price of $259.99 (Midsouth), the RCBS unit costs about $30-$40 more than the Lyman 1200 or the PACT. But we think RCBS is worth every penny of the slightly higher price. The RCBS dispenses the fastest, it warms up quickly, and it is easy to clean. We really think the RCBS ChargeMaster is the logical choice, unless you already own a PACT digital scale, in which case you may prefer the standalone PACT dispenser for $130 ($120 now at Cabela’s), since it is compatible with your scale. 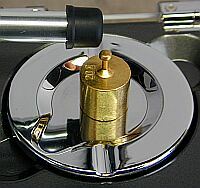 You give up some speed to the RCBS, but accuracy is comparable, ± 0.1 grain. All the units require calibration during initial set-up. For all three units calibration went smoothly, guided by clear and complete instructions. However, the PACT requires re-calibration EVERY time you change powder. By contrast, the RCBS can change powders “on the fly” without needing recalibration. If you use a variety of propellants, this alone is reason enough to select the RCBS over the other machines. Also, the calibration on the PACT seemed to be more affected by air currents and vibration. Some Lyman 1200 users have complained about zero “drift” and activation of a “drift alarm” when the zero moves over 0.3 grains. To avoid this, Lyman advised us to re-zero the unit frequently. Of the three units, the PACT has the best stated warranty. PACT offers a 30-day money-back guarantee, plus a full “no BS” lifetime warranty on the Dispenser: “If it breaks we’ll fix it free, no matter if you bought it from us, your friend or at a garage sale.” But there is a catch–the scale unit’s load cell is only covered for one year. RCBS covers its ChargeMaster (both scale and dispenser units) with a two-year parts and labor warranty. This warranty extends to all product owners, whether the original buyer or not. Lyman offers only a one-year parts and labor warranty. Lyman’s reps told us they can sometimes extend coverage “a few more months” on request. Warranty Policy 2-year Parts & Labor Warranty on all components. Not limited to original buyer. Return shipping. 1-Year Parts & Labor Warranty. Return shipping. 1-year on Scale. 30-Day Money Back Guarantee and Lifetime Warranty on Dispenser, not limited to original buyer. Return Shipping. Get the RCBS and don’t look back. It is the fastest electronic dispenser on the market, with accuracy that meets or exceeds the competition. It warms up fast, and has the smallest footprint. 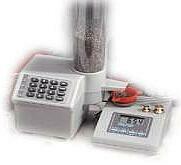 Removing powder is simple, calibration is simple, and the controls are easy to use. We would just like to see some index marks added to the powder tube and we would like to see RCBS offer a fitted cover and a stand to make it easier to dump powder when you’ve finished loading. If you already own a PACT scale, you can buy the Electronic Dispenser by itself for $129.95 directly from PACT. It will take longer to throw a charge, but you’ll get the job done for half the cost of the RCBS ChargeMaster or Lyman 1200 combos, with no sacrifice in precision. The PACT is American-made, and it boasts the best stated warranty of the three machines–lifetime on everything except the scale unit’s Load Cell. The Lyman 1200 throws accurate charges and, despite its slow warm-up time, it will speed up the loading process considerably compared to throwing charges manually. If you stick to the same powder most of the time, its cleaning shortcomings won’t really matter. If the Lyman 1200 cost less, we would rate it higher, but given the availability of the RCBS at nearly the same price point, the only real reason to get the Lyman is the higher number of pre-set recipes. Frankly, we don’t think ANY reloaders will probably input more than a dozen or so pre-set recipes. There have been user reports of software glitches and “wandering” zeros that need to be checked frequently. With only a one-year manufacturer’s warranty, think twice before going with the Lyman 1200. TECH UPDATE for the RCBS ChargeMaster. In a few short months the RCBS ChargeMaster has become the top-selling digital dispenser on the market. Most people using the RCBS ChargeMaster digital powder dispenser have been very happy with the unit. However, we’ve heard some reports that, on completing a dispensing cycle, the display shows the load to be the correct target weight, when in fact the unit is off by a one or two tenths of a grain. Since the read-out appears “dead-on”, the user doesn’t know he has a high or low charge. This is why we advise all ChargeMaster owners to initially check their charge weights with a precision scale of known accuracy. If the unit does not meet spec, RCBS will replace it during the warranty period. However, keep in mind that the unit is rated ± 0.1 grain, which means you can’t expect it to deliver the EXACT charge (to the tenth) every time–it may be a tenth high or a tenth low, for a spread of 0.2 grains. A recent ChargeMaster evaluation we’ve done, with charges checked with a Denver Instruments laboratory scale, did show the unit to be within ± 0.1 grain 95% of the time with H4350, and, with most powders, it delivered the exact charge (to the tenth) over 2/3 of the time. Still there are things that can improve the unit’s consistency. 1) Make sure the unit is perfectly level front to rear. Some ChargeMasters, particularly the early-production units, are sensitive to front/rear leveling. 2) Don’t leave the power cord coiled up in a loop; this can cause a magnetic field that can affect read-outs. 3) Use the hinged door that covers the dispensing tray. This will eliminate drafts. 4) IMPORTANT–after dispensing a load, pick up the plastic powder cup, swish it gently to distribute the kernels evenly, and place it back on the load cell. This “double-checks” the weight and will catch the vast majority of over-charges. 5) There is a high speed/low speed transition point at 25.0 grains of powder–if your load is right near this point you’ll see some fluctuation. You can call RCBS and they can tell you how to modify the high speed/low speed parameters. 6) RCBS can also tell you how to re-program the unit to slow the speed right at the end of the dispensing cycle. This has resulted in greater consistency for some users, who report fewer cases of charges “missing the mark.” 7) RCBS now ships the unit with a metal pan that is a bit heavier than the original plastic powder pan. Again, this seems to work a bit better. 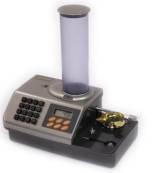 8) Use the factory-supplied check weights to test for calibration with each session; this only takes a few seconds. 9) Use a good surge suppressor, or better yet, plug the ChargeMaster into a line conditioner that provides “clean”, correct voltage. A few users told us all their problems disappeared when they plugged the power cord into a line conditioner or UPS (Uninterruptible Power Supply). “To sum this all up I have to say, based on my data, the RCBS is King. The RCBS for me wins hands down over the competition in speed, features and user friendliness. You can see by the data the RCBS dispenses powder almost twice as fast as the Lyman and PACT. That’s signficant–more so than you may think as I explain below. Speed is the primary reason to purchase one of these machines. I want to spend less time reloading and more time shooting. In comparing the three machines, I feel that where the other two dispensers falter the RCBS ChargeMaster shines–speed and ease of use. The Lyman has some serious flaws, in my mind–excessive warm-up time, unstable zero (Lyman recommends you “check zero” frequently to avoid drift issues), and a powder chamber that is very hard to clean. The PACT is a decent unit, but you have to re-calibrate whenever you change powders. A couple of things I would like to see added to all these units would be a graduated hopper and a stand to get the unit up high enough to easily dump the powder. I would like to share some methods used in the world of manufacturing and explain how they can be used with a digital powder dispenser to cut your reloading time by 60%. These methods are “Lean Manufacturing” and “Single Piece Flow”. By working on other loading tasks while the ChargeMaster throws charges, I can produce more than twice as much finished ammo in a given time period. The machine more than doubles my productivity. Single Piece Flow is a methodology used in Lean Manufacturing to speed up a process. Where multiple operations are used to built a part, the object is to do this process in the most efficient and productive way, thus improving profit margin. We can apply Single Piece Flow to loading with digital powder dispensers. End result–more ammo in less time. Total process time = 51 seconds per round. For 100 rounds, that’s 5100 seconds, which works out to 1.416 hours or 85 minutes. Now we can see that our longest Batch and Queue sub-operation (Op1), is 30 seconds for weighing a powder charge. If we can improve that time we’re putting money in the bank. Reducing Op 1 time is where the ChargeMaster excels. Our tests showed the RCBS ChargeMaster dispensed 50.5 grains of H4831sc in 8-11 seconds–let’s just call it 10 seconds. Then we add 3 seconds to put the powder in the case, 15 seconds to seat the bullet, and 3 seconds to place the finished round in the case. That give us a total of 31 seconds. So, just by using the dispenser (vs. a manual powder measure), we’ve reduced load time by 20 seconds (from 51 to 31 seconds per round). But we’re not finished yet. If we can simultaneously put powder in a case and seat a bullet, WHILE the powder (for the next round) is being machine-dispensed we can save even MORE time. In other words the human keeps working as the machine is cranking. Doing that, we can knock assembly time all the way down to 21 seconds per round. (How’d he do that, you might ask–well the machine is doing the weighing job while the human is doing something else at the same time, so it’s like having two guys on the job). That’s a 50-minute savings per 100 rounds of 6.5-284. I’ve reduced my overall reloading time by roughly 60% (58.8% to be precise). 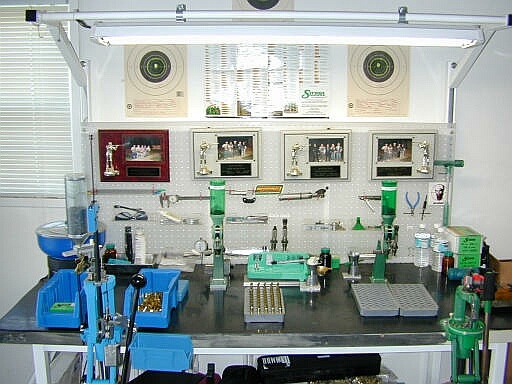 Or look at it this way–I can produce the same amount of finished ammo in less than half the time! To me that’s compelling. And the more you load, the more time you’ll save. Special thanks to Ward Brian of Sniper Tools for lending his Lyman 1200 and to Mike Holmes for lending his PACT. If So, You Can Help 6mmBR.com by Making a Small, Secure Donation. All content Copyright © 2005, 6mmBR.com, All Rights Reserved. No reproduction of any content without advanced permission in writing. Topics: Scale, Digital, Dispenser, Powder Measure, Accuracy, Reloading, Testing, RCBS, RCBS 1500, ChargeMaster, ChargeMaster Combo, Ohaus, 10-10, 505, Lyman, Lyman 1200, DPS, PACT, PACT scale, Calibration, Calibrate, 6mm, 6mm BR, 6BR, 6.5, 6.5mm, 6.5-284, 6PPC, Target Rifle, Benchrest, BR, Bench Rest, Single-shot, competition, rifle accuracy, BC, Ballistics, Norma, Hodgdon Powder, H4831, H4831sc, IMR, IMR 4064, Sierra, MatchKing, Competition Shooting, barrel, reloading, powder, bullets, precision, shooting, hunting, Lean Manufacturing.